Does the idea of beating up total strangers get you going? This weekend, if you’ve got nothing better to do (and maybe even if you DO have something better to do), head over to Centennial Park, where – at latest superofficialFacebookcount – almost 800 people have RSVPed to beat each other silly… With pillows. 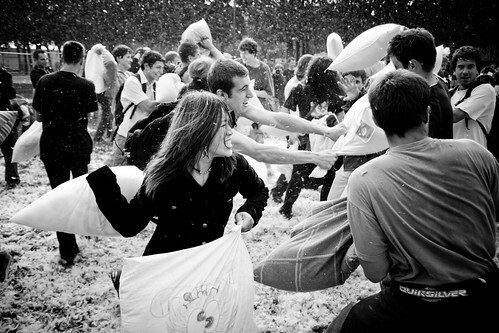 We missed the first giant pillow fight last September, but from the looks of the videos and photos, it was pretty intense. Check the Facebook event for more details. Show up with a pillow a little before 6pm on Sunday, March 22, at Centennial park in front of the Parthenon. Just look for the 800 people with pillows.